Inspirational works of art have always played a vital role in Brad Parrish's life as well as in his art. In this gallery you will find works of art by the artist who has always understood from whom his talent comes. He has always acknowledged and has given thanks to his creator for blessing him with this very special gift. The earliest works by Brad shown in this Gallery are the two paintings titled "Christ" drawn by Brad in 1972, followed by the "Creation of Adam" painted a year later in 1973. There are many original inspirational drawing, paintings and sculptures that Brad had created over the years that were gifted or gave away to those who loved the piece(s) with no record as to whom he gave them to and no photographs as to what they looked like. Several works were permanently damaged in a flood and some were stolen. This gallery is what is known to remain of his inspirational works. This is the second painting artist Bradley J Parrish’s “Creation Series". Both this painting and his first painting titled “Creation of Heaven & Earth” were winners in the annual ARC "Art Renewal Center" International Solon Competition, with the first painting in the series winning in 2006 and now this one winning in 2015-2016. The ARC Solon Competition is the most prestigious realist art competition in the Americas and perhaps the world. This piece is in their 2015-2016 international catalogs. Parrish says “I not only do I feel blessed feel that my very first painting in this series was recognized as an Internationally award-winning painting, but also that it had broken all records for the sale of just one of my works.” The $350,000.00 painting sold through an online broker after Bradley J. Parrish posted it for sale on their online website. This second painting in the series like his first one brings you to a moment of creation. In this powerful piece, Parrish captures our creator at the beginning of creation of the heavens and the earth. Here we see the world being created with the oceans, and the fiery emergence of the earth’s magma rising up from deep within the earth and cooling as it reaches the water and as a result steam rising toward the heavens. 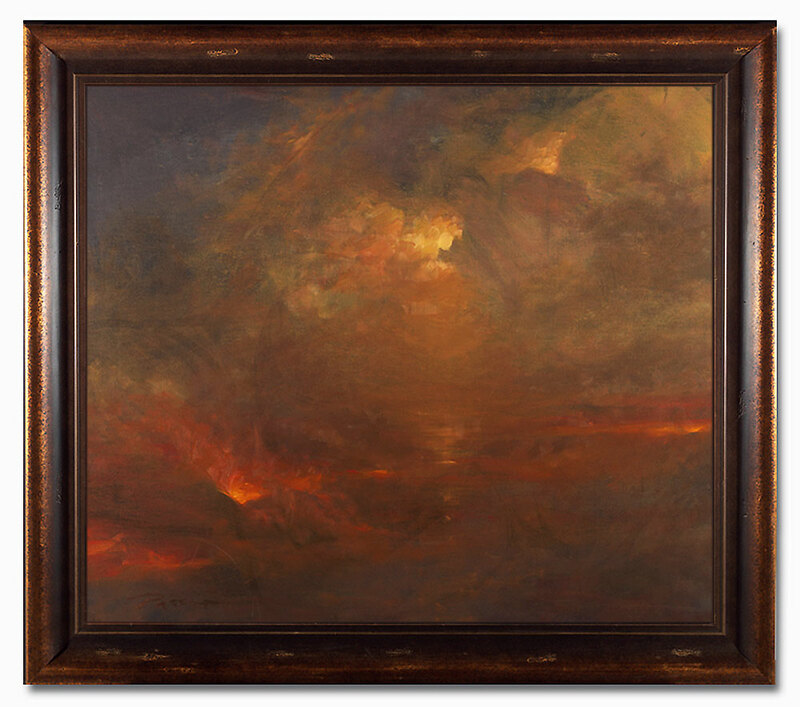 This painting is framed in an ornate solid wood frame finished in antique gold. The painting has been framed by a professional framer and comes with a metal French cleat attached along the top back area of the frame for hanging this piece to the other cleat which we provide with so that you can hang this painting on your wall. It is the safest way to hang a large painting such as this. The Creation of Adam was painted in 1973 when the artist was only 15 years old. It was painted on his mother's kitchen floor for a prestigious national competition titled Works on Paper sponsored by the Chicago Art Institute. Parrish's piece was delivered to the institution a day late due to mistakes the US Postal Service in Chicago had made. The institute had to refuse the entry as it did not make the established deadline. However the institute and their distinguished panel of judges, judged the piece the day after the competition as a courtesy to artist and had found that this work, had it been there by the deadline, would have been judged and selected the best in show and would have taken first place. This was the first major national art competition he had entered. By 1985 the original pastel was showing signs of degradation due to the fact that the artist was told by his art teacher that he could use his mothers hairspray on the surface to fix the pastel to the paper and did not have to use the expensive fixatives to protect and set the pastel to the paper beneath. The use of his mother’s hairspray began to bead up the pastel and over time began to fall off the piece. Brad attempted to repair the piece by applying more pastel, however it quickly became apparent that he was changing the entire look and feel of the piece and stopped any further repair. Fortunately, Brad photographed this piece before he began any repair work on it. Because of this, the image was saved. The original painting was stolen between the late 1980's and early 1990's and has never been seen since. The only reproduction of this piece is in the form of fine art limited edition prints, produced from those 35mm slides taken by him in high school. In 1986 Brad produced his very first limited edition fine art print of this work. A limited edition of 500 signed and reproductions, along with artist’s proofs and a small size open edition sell sheet. These are the only images that remain of this magnificent piece. Brad had approached a professional/commercial photography studio to see if they could use the slide that he shot of the piece in high school. The studio was amazed at the quality of the slide and after producing it as a full size photo from Brads slide, they were ecstatic at the results and had all of their photographers in a conference room to take notice of what one 35mm taken by a 15 year old had yielded. Films were made and Brad headed to the commercial offset lithographer to begin running the fine art reproductions. This is where Brad believes stronger forces were at play. Not only was the photography studio amazed at the quality of the slide Brad took, the printer and Brad were now amazed at the print quality coming off the presses of this piece. Normally it takes a lot of tweaking and adjustments to get the colors up to par when the presses are running to match the art or in this case the photo; not so with this piece. There was no need for adjusting the colors or the films. This piece was dead on and it was the very first reproduction the printer ever had this happen with. Brad has been on press supervising every one of his reproductions over the past three decades and never has any reproduction been up to color on the first run, except this one. The Vatican in Rome has one of these reproductions from this edition in their archives to forever protect this image from ever being lost so that future generations can look upon this piece in awe at what this artist envisioned at the age of 15 when he painted it. Recently the artist was going through storage looking for an original oil and found instead in an old locked crate several signed and numbered pieces that had been set aside from this the edition of 500 prints and also a few from the artist edition on this run. Brad is going to make these pieces available for sale only here on his website. Brad also found the extras unsigned and numbered prints on this edition which would serve to be used to replace pieces where mistakes might be made in numbering the piece or if there was a printer flaw in the run etc. their never was which says a lot for our printer and for the artist numbering these 500 pieces. The secondary market prices on this piece over the years have been very strong to say the least. We have never seen it for sale on the secondary market except one were it was available through a collector who posted an add for it in a Art & Antiques magazine national publication of in the early 1990's saying "Must Sell", they were asking for $5,000.00. Brad say's "If there is one print i cannot be without in my home, it is this one. 30 plus years ago I painted something that forever changed my life. It is a part of my life that gave me self worth and better understanding and appreciation of life itself. I believe it was at this time and place in my life at 15 years old that I began my life as I know it today. Brad was approached by a someone who's daughter had just lost her baby. Her daughter had bought an inexpensive painting of an angel holding a baby feeling that this was something that would help her get though her grief. It did not. The mother knew her daughter needed something with more feeling to help her daughter deal with the loss of her baby. She contacted Brad. She sent Brad a photo of the painting her daughter had purchased and asked him if he would paint one with more depth and emotion. Brad compassionately agreed. That night Brad thought how tragic the loss of a child would be. He envisioned what you see as the final painting above. When the mother of the daughter saw this piece, she was speechless. Both her and more importantly her daughter found this piece to be the answer to their prayers. They found comfort in the painting. *This original is available for sale. For more information on this piece, please see the "Available Originals" galley. This is one of the earliest surviving oil paintings completed by the artist when he was 15 years old. Brad had given this original to his friend and classmate Maria while in middle school. Brad says he remembers her crying when she saw it and was so moved by it that he gave it to her. She kept the painting for over 40 years. The last time they got together, the painting long forgotten by Brad, Maria returned it to him. Brad did not want to take the painting back but she insisted saying, "Thank you for giving me this beautiful gift. I have cherished it for most of my life, it has brought me so much happiness. It's time I return it to you." The true reason behind the return was revealed a few days later when a mutual classmate informed Brad of Maria's passing. Deeply saddened by the loss of his longtime friend, Brad has decided to let this painting go, hoping it finds another heart to touch as deeply as it did Maria's. *This original was reproduced as a Signed & Numbered Fine Art Limited Edition Print. 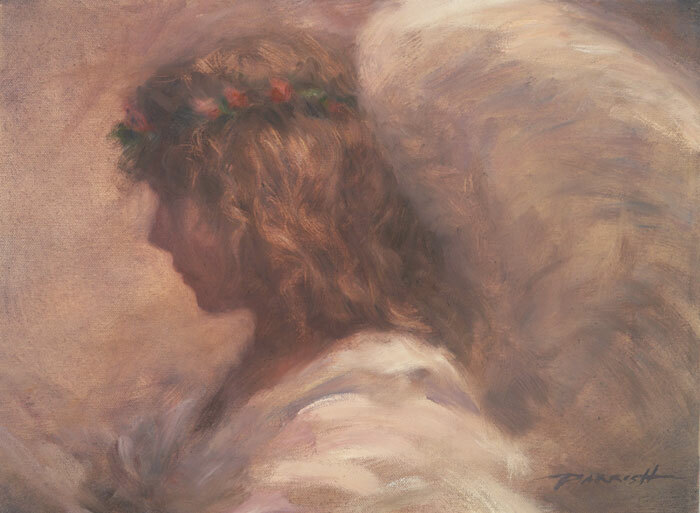 The Ultimate Sacrifice was created as a result of a possible heart attack Brad experienced while working on a commission painting for a church of an angel. In extreme pain, Brad promised God that if He would get him through this experience, he would then paint a piece to glorify his creator. As if it were meant to be, the chest pain resolved and Brad was able to complete the commission piece he was working on. He began creating this piece, 'The Ultimate Sacrifice' the next morning. Not knowing what this piece that he promised God would be, he began painting what he says was an emotional and spiritual pull toward the crucifixion of Christ. This piece was not planned out, not laid out, and not even thought out. It was Parrish with Mozart's Requiem blasting in the background and a divine spiritual experience that was driving Brad to paint this piece. The piece was painted in one 16 hour sitting. Parrish working from the center out knew he wanted to capture a close up and personal experience with the viewer and Christ in this his last moments. As he put it, "I was being driven to create a work that I truly believe was not my conception but that of God. I was the tool. I had already completed the head and torso of Christ and was working on his shoulders and arms when I realized I was not only an observer of this tragic event, I was for some a participant. I knew what to do next. I began scratching a box around Him. Here I was saying to Christ what so many had said to him on that fatal day, "Here you are, king of the Jews, lets frame you in and glorify you! Save yourself!" I found though my actions and efforts I realized that I had put myself in the position of those who crucified him. I was no better than any of those who mocked and crucified him. I found myself reaching for the red paint, a representation of Christ's blood that was shed for us. To the crescendo of the background music, I began throwing it at the canvas over and over again. Finally, I was exhausted, and as tears fell from my eyes I knew it was over, I could paint no more". The video above is a video clip from the one half hour documercial featuring three of Brads works from the "Parrish Collection" which aired nationally back in 1999 on A&E, the Discovery Channel and the History channel to name a few. A television production that paved new roads and was way ahead of it's time, giving millions of Americans the opportunity to own a work of fine art. * This original was reproduced as Open Edition Fine Art Prints in 1985. 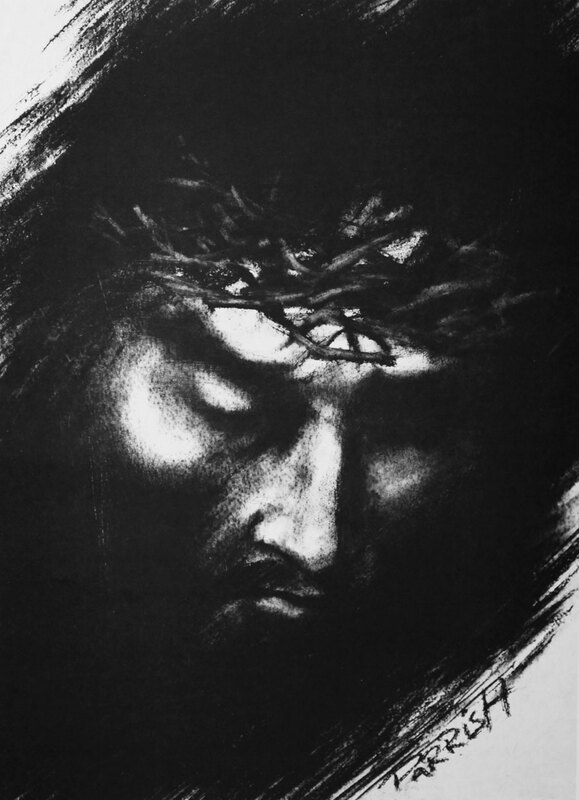 This piece the artist Brad Parrish created in charcoal when he was 14 years old. This is the first reproduction of the artists work that was reproduced as an open edition print which was printed and released in 1980. The original drawing was done on the wall of the artist studio/bedroom on butcher or meat packing paper that he got free from the local butcher. Unable to afford fine art papers or an easel, you can see in this drawing the dark charcoal dots that appeared or came through when Brad rubbed his charcoal across the sand textured that the paper was tapped to. Brad hated this happening as expressed how he hated what was happening to his drawing. The first painting in the series of creation works by artist Bradley J. Parrish. This $350.000.00 painting was sold to a major international art collector breaking a record for the amount paid by a buyer for one of the artist Bradley J. Parrish's current works. The Painting was also chosen by ARC the (Art Renewal Center) in New York for their annual "Solon" international art competition as one of the winning entries and featured in their international art competition catalog showcasing all of the winning entries.